The company, which provides broadband infrastructure to more than 580 CPs, will seek customer input on two major policy issues for the UK - building the investment case for a large-scale ‘full fibre’ network and bringing faster broadband speeds to ‘not-spots’ which can only order less than 10 Mbps services today. Openreach has already stated its ambition to make ultrafast speeds of more than 100Mbps available to 12 million homes and businesses by the end of 2020. However, the business is keen to explore conditions which might allow it to invest in more ‘full fibre’ - Fibre-to-the-premises (FTTP) - infrastructure. The consultation will look at the demand for FTTP, the potential benefits and costs of a larger scale FTTP deployment, and the enablers needed to support investment. Openreach is currently in a scoping phase and anticipates launching a formal consultation in the summer. 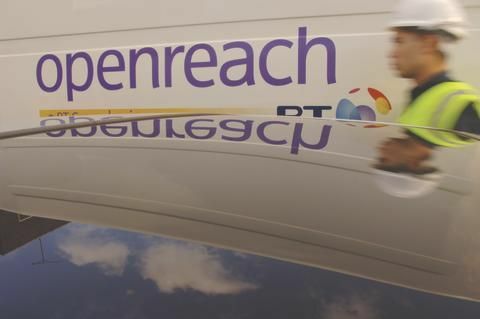 Openreach today also launched a consultation with CPs on the next steps for an emerging broadband technology called Long Reach VDSL – which has been proven to increase broadband speeds over long phone lines connected to its fibre cabinets. This technology could help to deliver universal broadband coverage in line with the Government’s policy objectives – set out in the Digital Economy Act – which seek to give everybody in the UK the right to request a broadband speed of at least 10Mbps. By the end of this year, 95% of the UK is expected to have access to superfast broadband speeds of 24Mbps and above – and as of today, just three per cent of the country cannot order a service offering 10Mbps or faster according to independent analysis by Thinkbroadband. The consultation process will enable Openreach to determine the best ways to deploy Long Reach VDSL technology with CPs to optimise the benefits for customers and to help the Government’s objective of delivering universal connectivity in the UK. Openreach has also announced changes to the way it plans to engage with industry. This includes a confidential process that will allow its CP customers the opportunity to discuss new strategic initiatives privately with Openreach, prior to any potential public consultation. The moves form part of Openreach’s preparation for greater functional separation from BT Group, its parent company, alongside the creation of an independent board structure and commitments to improve standards for customer service. It is hoped that more private discussions with CPs will lead to greater openness and collaboration across the communications industry and result in better outcomes for connected homes, businesses and people throughout Britain. Openreach has been working closely with customers, the regulator Ofcom, and the Office of the Telecommunications Adjudicator to define the new collaboration processes, and it has now shared these proposals with the industry to seek views and improvements. “Everyone in Britain should have access to a decent broadband speed – so we support the Government’s moves to make that a reality. “We’ve been working hard to develop faster, affordable ways to connect remote locations and we’ve been pleased with the initial technical field results of our Long Reach VDSL trials, but we need Communications Providers’ support to make sure their customers can be upgraded and migrated smoothly to this new platform.